New Wilmington Hotel HotelOur charming hotel offers the perfect stop for groups, couples and families in search of a relaxing coastal holiday or adventurous getaway. 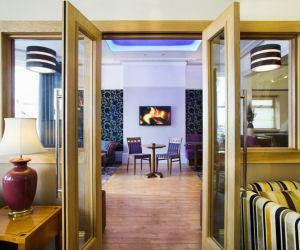 The New Wilmington is an independent AA 3 star hotel located in Eastbourne since the 1920’s. We pride ourselves on the ability to move with the times while keeping to traditional values and strongly believe our passion for service and quality has established the New Wilmington as one of the most well regarded hotels in the area. With Eastbourne’s award winning seafront, theatres and art gallery just a 2 minute stroll; guests have the ideal location to explore Eastbourne during the day and the evening. A selection of Economy, Standard, Standard Plus and Superior Rooms, guests have an option to suit any budget. Optional upgrades like sparkling wine on arrival, chocolates or fresh flowers can be arranged for that special occasion and no request is too much for our staff. We believe the thoughtful touches make the perfect stay and with this sentiment our staff consistently set the level of service above expectations. Members of staff regularly receive special praise on review websites such as TripAdvisor. The New Wilmington is one of Eastbourne’s most highly rated hotels and has been awarded the TripAdvisor Certificate of Excellence for two years in a row. Our head chef changes the menu on a daily basis to allow us to offer fresh seasonal cuisine and we try to source our ingredients locally where possible. With prior warning the New Wilmington will do everything possible to cater for those with special dietary requirements as well as prepare packed lunches for those fun packed daytrips. To get you started in the morning, you can look forward to a full English or continental breakfast along with a variety of drinks including specialty teas and coffees. If guests wish to relax our peaceful lounge at the rear of the hotel offers the ideal environment to converse, read or watch television on our flat screen TV. If a more social environment is desired; our modern bar is a place where you can unwind with a glass of wine or maybe even a cocktail or two. Those in search of a little extra fun will love our regular evening entertainment, which promises a great night for the whole family. Throughout the year we offer special offers, packages and discounts, guaranteeing that if you see a better like for like price for the New Wilmington anywhere else we will beat it. Our Guest Club members receive the first chance to take advantage of these deals along with complimentary room upgrades where possible. To join our Guest Club simply call reception and one of our staff members will be happy to help. Level access, a passenger lift which services most floors and a stair lift means hotel facilities can be utilised by almost all guests. We advise customers with special access requirements inform us when booking. Secure garages are available for a fixed fee per night and the hotel has a secure area for bicycles, mobility scooters and similar items. Although we provide Disabled Facilities we advise anyone with limited physical ability to contact us in advance to discuss the level of support required. Children welcome from any age. New Wilmington Hotel sometimes limits bookings to 2 or more days. Our Economy rooms are cosy and contain all the comforts you’ll require, with either baths with shower over or walk in showers. Dinner is an extra £18.50 per person per night at time of booking. Economy Double sometimes limits bookings to 2 or more days. With all the modern comforts, the perfect room choice, with either baths with shower over or walk in showers. Standard Twin sometimes limits bookings to 2 or more days. For extra comfort and space, with hotel front facing views with large bay windows, luxury toiletries basket, mineral water, bath with shower over/walk-in shower & our best quality linen. Please contact the hotel directly for our rate for a 3rd guest. Room prices are based on meals for 2 adults. Breakfast is an extra £8.50 and Dinner an extra £18.50 per person per night at time of booking. Follow signs to the seafront with the sea on your left. Continue along until you reach the Wish Tower. Turn right into Wilmington Square and turn left at the end of the road and we are second on the left. We stayed overnight whilst visiting relatives in Eastbourne. The public areas are very inviting and all the staff we encountered were very welcoming and helpful. The restaurant is spacious and there was quite a varied menu on offer and a special for Sunday - although another option for Sunday roast, instead of pork, would have been nice. Rooms are nicely decorated, comfortable and clean. We would have no hesitation in staying here again.